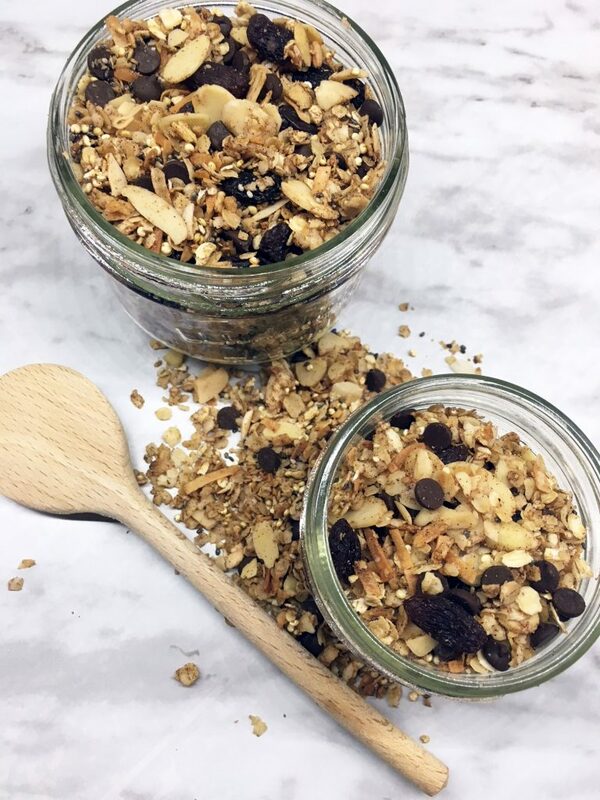 It’s amazing what the addition of chia seeds and quinoa can do for granola. Not only does it provide so much extra nutrition, it adds a different kind of texture and bite. I had to add coconut because toasted coconut adds so much flavour. I decided to use sliced almonds rather than whole because I like that light crunch it provides. The cinnamon and maple syrup just take it over the top, making this granola oh so good. I am picky as to what dishes I add raisins too. I’m also picky about my raisins. They have to be the dark plump ones. I am not a fan of the golden ones. Since this granola is full of so much goodness, I figured a small dose of chocolate was needed. It does make people happy, right? This is perfect as a snack and delicious over yogurt. In a large bowl, combine all the ingredients except for the raisins and chocolate chips. Spread onto a sheet pan and bake at 350 degrees for 20 minutes. Let the granola cool and then add the raisins and chocolate chips. « Calcutta Cricket Club does brunch!